My old friend Peter Nicholls died on 6 March 2018, just two days short of his 79th birthday, as a result of complications from Parkinson's disease. Although we all knew the end was coming, it ultimately happened quite suddenly, as these things often do. The funeral took place in Melbourne on 15 March, so Jenny Blackford and I flew down for a hit-and-run visit to the city where we lived for three decades. We'd been close to Peter, especially during the late 1980s and through the 1990s, before he began to slow down and become more reclusive after being diagnosed with Parkinson's disease in 2000. Jenny was especially close to both Peter and his wife, the fine editor Clare Coney (who was employed by Gollancz, back when she and Peter lived in London, a generation ago now). Peter and Clare were regular attendees at the (sometimes slightly crazy) parties Jenny and I used to host on special occasions - particularly each New Year's Eve - at our Port Melbourne house in the late 1980s, and subsequently at our big old Victorian terrace in Albert Park, where we moved toward the end of 1989. (We shifted interstate, to Newcastle, almost exactly 20 years later, at the end of 2009.) For their part, Peter and Clare were known for their generous hospitality, hosting many lavish gatherings, large and small, at their grand home, with its vast private library, in Surrey Hills. I dedicated my most recent book (Science Fiction and the Moral Imagination; Springer, 2017) to Peter, knowing that it would at least be meaningful to Clare and the rest of Peter's family, even if Peter himself could not entirely comprehend it (by this point, he was at a very late stage of Parkinson's). In the book's Acknowledgments section, I state: "I have dedicated this book to Peter Nicholls, the great encyclopedist of science fiction. 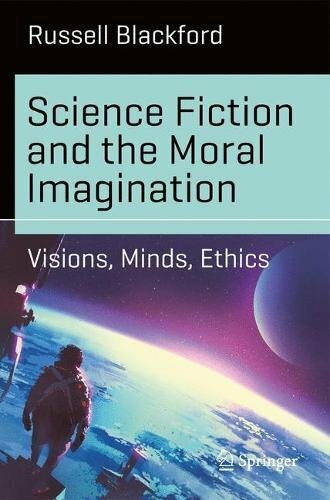 For four decades, no one has engaged meaningfully with the [science fiction] genre without benefiting from his scholarly work." This sums up one aspect of his life. Peter wrote numerous books and other works about the SF genre, setting a particular style and standard - clear, straightforward, and accessible, but deeply scholarly - for his contemporaries and those of us who followed after him. In particular, he was the creator of The Encyclopedia of Science Fiction, editing its first edition and establishing the template for its subsequent editions for which he was co-editor and later editor emeritus. Clare Coney bravely MC'ed the funeral service herself - very competently indeed - and she spoke movingly of Peter and their life together. Among others there from the Australian science fiction community, I should mention Janeen Webb and Jack Dann; Sean McMullen, Catherine Smyth-McMullen, and Trish Smyth; Carey Handfield; Paul Collins and Meredith Costain; and Justin Ackroyd. This is not meant to be a complete list, and apologies to anyone obvious whom I've overlooked here. Peter's close friend and collaborator, the author and scholar John Clute, did not make it from overseas, but Peter's son, Jack Nicholls, read a speech that John had sent for the occasion. Neil Gaiman, another of Peter's closest friends, sent a recorded speech that vividly told the story of their friendship. The venue was full - standing room only for latecomers - with Peter's numerous relatives and old friends. All four of Peter's sons (Saul Cunningham, Tom Pollak, Jack Nicholls, and Luke Nicholls) gave generous and emotional speeches about their father. His daughter, Sophie Cunningham, was not able to make it back from the US, where she'd flown just days before Peter's death, but she sent an especially beautiful and moving speech, read by her wife, Virginia Murdoch. Peter was proud of his five children, and he'd have been especially proud at their portraits of him and their expressions of love, and what he meant to them. Peter's sister, Meg L'Estrange, read a lovely tribute, and his old friend from his university days, the poet and literary academic Chris Wallace-Crabbe, read a poem that he'd composed. Strangely, I learned things about Peter that I hadn't known when he was alive, including things that we'd had in common: both of us were very sickly as young children, forced to spend much time in our beds, which was one reason why we developed our immersion in books, and our love for them; and like me, Peter had recurrent nightmares about huge tidal waves. Who would have guessed? Afterwards, Clare hosted a wake back at the Surrey Hills place. It was in the usual Nicholls/Coney manner, with no shortage of food or wine; it was easy to expect Peter to wander in at any moment, waving his wine glass and telling some anecdote in enthusiastic or scandalized tones. Peter was a physically imposing man with a splendid girth, a magnificent voice, and a big personality. He lived with gusto, and on a large scale, with more than the usual number of wives, lovers, children, cigars, fast motor vehicles, and countries that he called home at one point or another (I've borrowed some of this wording from Sophie's Facebook page). He has left behind an important legacy of scholarship and literary criticism, as well as his wonderful family. The funeral service, organised and managed so well by Clare, painted a three-dimensional picture of the man, his personal style, and his contribution to the world of letters. He'll be much missed, as he would have wanted. "Think where man's glory most begins and ends, and say my glory was I had such friends" (W.B. Yeats). Jerry Coyne on "Don't shoot the messenger..."
At his Why Evolution is True site, my good friend Jerry Coyne has a post about my recent piece ("Don't shoot the messenger when confronted with inconvenient ideas") at The Conversation. New post at The Conversation ... "Don't shoot the messeger..."
Over at The Conversation I have a new post "Don't shoot the messenger when confronted with inconvenient ideas". Check it out! I comment on a range of issues from the James Damore case to denial of climate change science. My point is to deplore the strong human tendency not only to reject inconvenient messages but to view the bearers of certain kinds of messages - disliked messages on intensely politicised topics - as therefore ill-intentioned people who are not even worth listening to (and who perhaps should be punished in some way). Nominations for the Hugo Awards close very soon - on 16 March 2018. 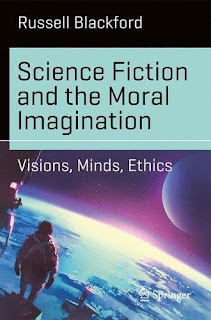 This year, I have a book, Science Fiction and the Moral Imagination: Visions, Minds, Ethics, that is eligible in the "Best Related Work" category. If you are eligible to nominate work for the Hugo Awards, please consider nominating Science Fiction and the Moral Imagination. Only do so if you genuinely think it is worthy of appearing on the shortlist - I'm not asking for favours from people who don't actually think that. Nor, sadly, do I have any bribes to offer. On the other hand, I don't have a big enough name (or enough of a network of relevant people) that I am one of the usual suspects when the time comes around for these awards. A book by me from an academic publisher, even an excellent international publisher like Springer, won't immediately come to a lot of people's minds. So ... this is your reminder that the book exists, has been getting good feedback so far (though I have yet to see any formal reviews, i.e. other than Amazon reviews), and might reasonably be thought up to the required standard. I'm nudging you to at least consider it. An article in the peer-reviewed journal Cell has announced the successful cloning - carried out by a research team from China - of macaque monkeys using the somatic cell nuclear transfer technique (SCNT) (also see a brief report here). In principle, this takes us one step closer to the possibility of cloning by SCNT as a method of human reproduction. Over the past twenty-one years, since the creation of Dolly the Sheep by SCNT, some of the moral and political heat has gone out of the issue, partly because of great difficulties experienced even in cloning non-human primates. It was starting to look as if human reproductive cloning was as far away as ever. The article in Cell should not be taken to mean that human reproductive cloning is just around the corner. It isn't. Nonetheless, this is exciting research. Before anyone panics about the implications for humans, note the success rate. The researchers were able to use the SCNT technique to produce 2 healthy macaque monkeys from the DNA of fetal cells, after 6 pregnancies from attempts involving 21 surrogates. They were also able to produce 22 pregnancies, after attempts involving 42 surrogates, leading to 2 babies that were short-lived, using adult somatic cells (specifically cumulus cells). This is impressive. All the same, despite great efforts, the team failed to produce healthy clones of adult macaque monkeys. We should, I think, conclude that researchers in this area remain a long way from being able to create clones of adult (or other fully-formed) human beings at will, using SCNT. I'll be interested to see whether the slightly closer prospect of human reproductive cloning, as a result of this research, revives the moral panic of the late 1990s, following the announcement, in early 1997, of Dolly's birth in 1996. Perhaps the lengthy passage of time just to get this far will dampen down the degree of panic, though the Cell article is only just becoming widely known.